You’ve Got Questions About SEO, and We’ve Got Answers! Our clients often ask us questions about SEO, and for good reason! The rules of SEO seem to change frequently and keeping up with the current recommendations is a daunting task. Here, we answer the most common questions our SEO team gets. We hope that you find the SEO answers you seek on this page. If you don’t please do not hesitate to call 888-886-0939 to speak with a member of our U.S.-based SEO team. How can attorneys get review stars displayed in Google search results? Compared to other Google SERP features, law firms actually have a lot of control over the ratings and reviews that are displayed to users in these kinds of “rich snippets.” While there is no guarantee that Google will display your review stars every time your pages come up in search, taking full advantage of this feature can make you stand out to Google’s users and stimulate more click-throughs from search. Google can only pull from what you have set up, so you need to use “review schema” on your website if you want review stars to display for your law firm. Review schema is a bit of code that lets search engines know that the review information is there and makes it possible for them to incorporate it into the results they show their users. 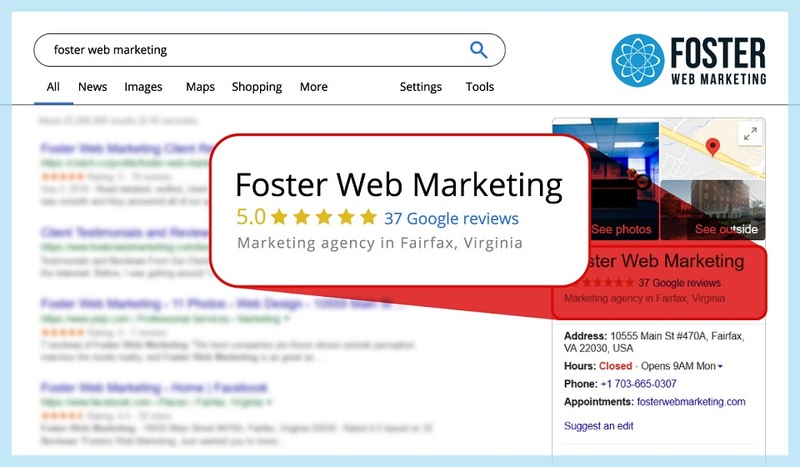 Essentially, you choose the reviews and ratings you would like to display, add the appropriate code to your website, and hope that Google chooses to display enhanced results for your firm. Don’t use review schema on your homepage. There is no need to add review schema to your homepage. Due to past abuses, Google no longer displays rating stars for homepages in organic search. Do use review schema for other core pages. While you can’t use review schema for your homepage, you should add it to the service area pages, office pages, about us pages, and bio pages on your website—basically all the main pages that talk directly about your firm, your attorneys and staff, and your services. At FWM, we do not recommend that you try to add review schema to blog posts, articles, or other supporting pages on your site because the reviews are almost never directly relevant to those pages. Reviews listed on a page must be relevant to that page. If you use review schema on a page, you should choose reviews and ratings that are directly relevant to the page. This is especially important for law firms that have multiple attorneys or many practice areas. For example, you wouldn’t want to add a review for the wrong attorney on a bio page or a review from a personal injury client on your estate planning page. Why Aren’t Review Stars Showing on Google SERPs for My Law Firm? Messed-up code. If the review schema code you add to your website is a little off, then it could prevent search engines from using that information. If you think your code might be the source of the problem, you can contact your web provider or use Google’s Structured Data Testing tool to check for problems. Wrong page or place. Like we said above, Google won’t display review stars for homepages, and you should limit the use of review schema on pages that aren’t directly relevant. Google won’t display review stars if you aren’t playing by the rules. Google’s mysteries. There is no guarantee that Google will display review stars in every search that brings up your marked-up pages. If you only sometimes see stars for your law firm on the search results page, then everything is probably working as intended. Keep in mind, too, that Google can and will penalize you if you abuse review schema on your website or try to “trick” search engines into enhancing results for your firm. The end result could be completely stopping your traffic, and extra traffic is the whole reason to even get involved with review schema in the first place! Need help getting review schema to work for you? Want to take advantage of more SERP features that enhance the search results people see for your firm? Give us a call at 888.886.0939, or let’s talk about what a fresh website design can do to bring more clients through your door. What Is Video Schema and Why Should I Care? How can doctors get review stars displayed in Google search results? For doctors and medical practices, taking full advantage of these review stars can be an easy way to build trust with potential patients and stand out from other search results. It is a feature that we recommend for our clients and think has a lot of benefit. There is no cost for the review stars that show in Google’s organic results. However, there are a few steps you’ll need to take to get your website set up and in line with Google’s review-star rules. Google only knows about the reviews and ratings your website’s code tells it about. That means that your website provider needs to add “review schema” to certain pages on your website. This little bit of code makes the review information you choose available to search engines. The search engines can then choose to incorporate that information into the results they show their users. If you sometimes see review stars for your practice in Google’s organic search results, then you already have review schema working on your website. While you have total control over which reviews and ratings are displayed by this feature, only Google controls when and where that information is seen by its own users. There are right ways to use review schema, and there are wrong ways. Abuses of review stars and review schema typically lead to Google penalties, and the search engine has even made major changes to how it uses the review-star feature to curb misuse in the past. Review schema does not belong on your homepage. Widespread abuses of review schema in the past led Google to stop displaying review stars for website homepages. For now, at least, there is no need to use it on your practice’s homepage. Review schema does belong on other core pages. You should add review schema to the pages on your website that talk directly about your practice, your doctors, your staff, and your services. These should be core pages on your website, like service-area pages, office-location pages, about us pages, and bio pages. Relevance is the main concern. Google is most interested in displaying review stars that are directly relevant to a particular page. The review schema on a doctor’s bio page should only point to reviews of that doctor. The review schema on a service-area page should only point to reviews of that service. This is also why we recommend that you stick to using review schema only on your main pages. Your practice’s ratings and reviews are almost never specific to a particular blog post, FAQ, or minor supporting page on your site. Review Stars Still Not Showing for Your Medical Practice? Even when you add review schema to your core website pages, you won’t see review stars in every search for your practice. Google is a little mysterious about when and how review stars and other search engine results page (SERP) features are displayed. The code on the page. Contact your website provider or use Google’s Structured Data Testing tool to check for errors in the code used on your pages. Any problems with the review-schema markup could interfere with search engines’ ability to display your star ratings. The page you added the code to. Google does not display review stars on certain types of pages, and we talked about why above. If you have checked your code and still don’t see review stars, it may be a sign that you are trying to use review schema on the wrong kind of page. Remember that you want to stick to main pages that are about the people in your office and the services you provide. Google gives medical practices a lot of options for enhancing the search results that potential patients see. If you need help leveraging review schema or other search features, reach out to our team at 888.886.0939. We would also be happy to talk with you about how to build better functionality into a fresh, modern website in a website design consultation. What is Project Beacon? What do beacons mean for my business? Did you get a little box from Google’s Project Beacon with a strange device inside? If so, you probably didn’t get a lot of information about what to do with it or what it means. The information included with the new beacons is sparse, and—so far—the packages are only going out to a few, select businesses. Google describes beacons as “one-way transmitters that are used to mark important places and objects.” In practice, the Bluetooth-powered beacons can send information to users’ mobile devices when they get within a few meters of the physical beacon location. This might mean that someone could walk down the street, get near a local restaurant’s beacon, and get specials sent right to their phone. If a law firm has a beacon-enabled, potential clients could park nearby and get step-by-step walking directions from their phones to the front door. Beacons can be used in offices, stores, public buildings, and other fixed locations, and they can also be used on vehicles, like buses and taxis. There are a lot of possibilities, and there are a lot of potential uses to explore as Google reveals more. Beacons are still a little new and mysterious, and there are lots of musings out there about their potential benefits, especially now that Google has entered the ring. Why Do I Want a Beacon From Project Beacon? Helping you get more reviews. Beacons from Project Beacon help stimulate reviews, photos, and more from people who have stopped by your office location. Refining location and proximity. Beacons can put you on personal maps for users that have turned on Location History, and it can reduce confusion because it transmits from where you actually are. Improving the client experience. Beacons make it easier for people to find you and engage with your business, and it brings your online and offline messages together locally—where it matters most. Getting involved with Project Beacon now also means that you get access to additional features as they are released. Keep in mind that the beacon doesn’t give information directly to business owners, and it’s hard to say exactly what kinds of metrics Google may provide for beacon users in the future. Having a beacon doesn’t automatically improve visibility in local search, but the benefits it does provide are the right mix to support most local strategies. It’s optional for now, but it is something cool to try that might improve the experience of clients visiting your physical office location. How Do I Get One for My Business? Learn how you can get and configure beacons here. Do you have questions about how to leverage Google’s beacons or how to take your local SEO strategy to the next level? Contact us at 888.886.0939, and let’s start talking. How Can Local SEO Help My Business? What is the difference between hard and soft 404 errors? Sometimes, old or outdated pages on your website need to go. Deleting stale web pages or content is just part of regular maintenance, but deleting a page leaves a void on your site—and you need to take the steps to let Google and other search engines know if the content is really gone, or it has just moved. This is why it is so important to understand the different between “hard” and “soft” 404 errors. Wait a Minute: What Is a 404 Error? When a searcher tries to open a page on your website that no longer exists, your site generally reacts two ways: by displaying a generic or custom “Page Not Found” page and by returning an HTTP response code 404 from your server that indicates the page isn’t there. While the reader may be satisfied with the displayed message or a redirect to other content, the crawlers from Google and other search engines depend on the code returned from your server to determine if there is content on the page that should be indexed. There’s a right way and a wrong way to delete pages. Although the difference may not seem that important, especially compared to content creation and your other marketing tasks, going the wrong route means that you’re essentially wasting Google’s time and taking some of the juice away from your real pages—the pages that feature unique information and core content. Think about it. Do you really want Google to continue to index a bunch of pages on your site that just say “File Not Found,” or would you rather let search engine crawlers focus on crawling your content that still exists? Don't let the name fool you. Soft 404 errors are much harder on your website's visibility than a hard 404 error. A “soft” 404 error happens when the wrong code (often the 200 response code) is returned by your server when someone tries to access a page that no longer exists on your site. Even if your website displays an error page to the reader, it still needs to return the right error code to let search crawlers know to ignore the page. Or, you have deleted an old page and you redirected it to a new page that isn’t relevant to what the original content was on the old page. When your website’s server does not return a 404 code (or a 410 “Gone” code in some cases), search engine crawlers are essentially being told content does exist on that page, and will spend time attempting to index that “content.” If the number of soft 404 errors is high, especially in comparison to the number of “real” pages on your site, it can have a negative impact on your organic search performance. Google recommends using Fetch as Google or similar tools to verify whether a particular URL on your site is using the right HTTP response code. When everything is working the right way, your reader will see an error page, and your server will return a 404 or 410 response code. This lets both readers and crawlers know that the page doesn’t exist anymore and shouldn’t be indexed, and that page will be removed from search results over time. This means that the possibly limited time Google’s crawlers spend indexing your site can be concentrated on the pages you really want indexed—and it helps the crawlers better hone in on what your website is really about. And, by using a custom 404 error page or redirecting readers to other relevant and helpful content on your site, you basically eliminate the potential for problems when you remove a page. 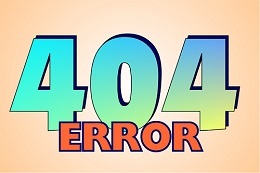 At Foster Web Marketing, the confusion over soft and hard 404 errors is handled automatically for our clients in DSS. By using a 301 “permanent redirect” we essentially offer an easy way to direct users and crawlers away from a deleted page and toward an updated or similar page. In DSS, you can redirect pages automatically when you delete them. However, you still need to select the most relevant new page of information to send the old page traffic to, or you could still have issues with soft 404 errors. You don’t want to be in a situation where readers are directed to irrelevant pages that don’t answer their questions or where crawlers index the same page over and over again through removed pages. So, if you have content on your website that is not relevant to anything else on your site and you want to get rid of it please reach out to our customer service team to help you figure out the best course of action. Do you have questions about 404 errors, page redirects in DSS, or how Google indexes your website? Don’t hesitate to give our friendly SEO team a call at 888-886-0939. Does the domain extension for my website affect my search engine rankings? Domain extensions can be helpful in giving consumers basic information about a website, such as .gov for municipal sites and .edu for online homes of schools and universities. However, there is no ranking benefit for using .edu over a .com—and Google won’t be handing out any bonus points for newly-minted domain extensions, either. You may remember from our previous blog posts on domain extensions that many new domain extensions are becoming available. In addition to .com, .gov, .org, and .edu, we may soon see .app, .radio, .help, and nearly any other extension imaginable. 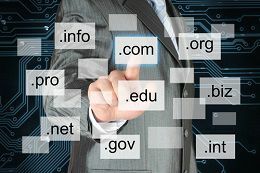 These new extensions are called Generic Top-Level Domains (gTLDs). Google has recently confirmed that websites with new gTLDs will be evaluated based on the same geo-targeting settings as other sites, and will not be given any more or less weight when the search engine crawls, indexes, or ranks URLs. In short, using a new gTLD will not give your website any advantage in search results. How Can I Be Sure My Domain Name Isn’t Working Against My Marketing Strategy? As long as all domain extensions are treated equally by search engines, businesses have the freedom to choose and create a domain that best fits their brand. The SEO strategists at Foster Web Marketing can help you find the domain extension that makes the most sense for your long-term goals. Call us today at 866-460-3724 to find out which domain names and extensions would be best for you, or browse through our links to learn more about how to apply search engine optimization to your website. What Do Domain Extensions Have to Do With Attorney Marketing? What is Universal Analytics and how do I make sure that I have it? Some people love to hate Google because of all its updates, changes, and rules. We acknowledge that this can be frustrating, but we also know how valuable the search tool is! And, every now and then, Google gives us a gift that doesn’t require a mad dash to fix our backlink profiles or clean up our over-stuffed content. This time, we’re excited to receive Google’s gift called “Universal Analytics!” You should be excited, too. It’s important to note that if you’re a client of Foster Web Marketing, you automatically have a Google Analytics account set up for your website, and therefore your account has been already upgraded to Universal Analytics. Login to your personal Google Analytics account. Go to your Admin page. If you see “Tracking Info” under the “Property” column (the middle column), that means your account is already upgraded. You’re done! If you don’t see “Tracking Info” and instead see “Tracking Code,” then your account has not been upgraded. There should be an option in that same middle “Property” column that says “Universal Analytics Upgrade.” Click this and follow the steps. As always if you need any help at all, or would like us to walk you through the new features, call 888-886-0939 or shoot us an email. How do I prevent reviews for my business from being removed from Google, Yelp, and other review sites? Reviews have become increasingly important for all businesses. If you want to do well, you have to have a good review reputation online. Unfortunately for attorneys, podiatrists, and other physicians, these reviews are hard to get. That’s why so many of our clients ask us questions about how to make sure that the reviews they get stick—that they aren’t filtered out by the big review sites (Google, Yelp, FindLaw, HealthGrades, etc.). Can I have people leave reviews from my office? Yes and no. The one big no-no here is setting up a computer in your office for reviews. Review sites are onto this and can tell if reviews are all coming from the same IP address. If they see it happening they will yank all these reviews. However, it is acceptable to have them leave a review from their phone, so don’t be afraid to encourage pleased patients, clients, or customers to submit a review before they leave your office. For more on how to ask for reviews, read our article on exactly how to ask for reviews. Can I offer a discount or gift for a review? No. Never offer an incentive for people who leave a positive review. This is strictly forbidden. Some people have tried to get around it by giving the gift and saying it’s for any review, positive or negative, but we don’t recommend doing so. Just get reviews the old fashioned way: earn their praise and then ask them to share the love. Can I send people to review sites from my website? Keep the content on these pages short and sweet. Don’t distract visitors with a ton of modules or other info; you want to point their eyes directly to the review site buttons, leading them down a clearly marked path to review success! 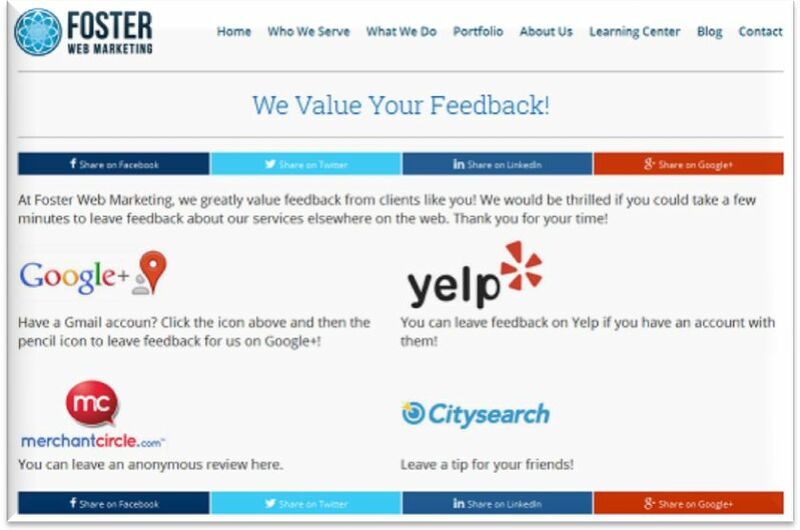 It is important to note that while we normally don’t see reviews cleared out when a review site is accessed from a website, there is one notable exception: Yelp. To avoid this, only send users to Yelp thorough a button on your website that uses a Google search link. This way Yelp won’t see you send people to their site, but the link will still offer direct access to your page on the review site. One word of caution: Make sure you choose the right link, the right business, when you look at your search results. That may seem like a no-brainer but it can be tricky, especially given how many similar brand names there are, particularly in the podiatry field. Should I pay someone to get reviews for me? If someone offers to dramatically increase the number of good reviews you get, run away! The only people who offer instant positive reviews are cheating cheaters who cheat, and any reviews you get will be fictitious and almost guaranteed to get your reviews, both real and fake, yanked from review sites. Goodbye hard-earned, legitimate reviews! Now, if you have a law firm marketing company helping you run an ethical review acquisition campaign, that’s a different story. There is a lot of leg work involved in getting good reviews and managing your online reputation, so there is no problem if you hire this work out. Just never hire someone who promises are too good to be true. Can I transfer testimonials or written reviews to review sites? No. If you’re sent a kind, glowing email, or someone responds positively on a comment card in your office you absolutely cannot transfer these kind words to reviews sites. What you can do is use this opportunity to ask for a review. When you get a positive email response or comment, either verbally or in writing, ask for a review. Thank them for their kind words and ask if they wouldn’t mind sharing them with other looking for excellent legal or medical care, pointing them to your “Rate Us” page. Should I ask friends, family, and my employees to write reviews? No. While it can be tempting to send out an office-wide memo to ask employees to write a positive review, or to broach the subject with your family over Thanksgiving dinner, don’t. Not only could this get reviews yanked (if they all come from your office, for example), it’s just bad business. It’s disingenuous, it’s cheating, and it can create a bad feeling among your staff; nobody wants to feel forced into this kind of thing. So save your relationships, and your reviews, and work on getting legitimate reviews using advice from our Reviews Matter webinar. I hope that I’ve answered all of your questions on the right and wrong ways to get reviews. If you have any other questions about reviews please do not hesitate to call 888-886-0939 or fill out a contact form on this page. We’d love to hear from you! I am a doctor who recently got divorced and have legally changed my name. Do you think I should keep my former name on my website and online, to assist in patient recognition or for SEO purposes? This excellent question was posed by one of our clients. The physician had legally changed her name, but didn’t know the best way to proceed when it came to changing it online. On one hand, she was ready to be done with her old name, but she didn’t want this change to affect her visibility online. She was right to be concerned! There is a very good chance that patients who haven’t seen her in a while, or prospective patients who have been referred from a friend, will search using the old name. Whether it was a divorce, marriage, or entrance into the witness protection program, it’s important that you change your name not only on your website but also on external directories and profiles like healthgrades.com or avvo.com. I’m not going to sugarcoat it: this is going to be a tall task, but it’s a necessary step. To help you through this process I will outline exactly how to go about finding where your name is listed on the Internet, and then give advice on how best to make the changes needed. Please note: As the client who asked the question was a doctor I am going to use a physician in the examples below. However, any professional or business owner who relies on her name for brand recognition needs to attend to each of the steps listed. Ideally, you’ve already performed a local listings audit and have an extensive, well-organized list of everywhere your business is listed. If so, please move on to step three. If not, it’s a good idea to do this now. Start by searching for your name and your profession on Google. You will use the search string equivalent to “former name doctor”; for instance, “Rachel Elkins podiatrist.” You may wish to make repeated searches using synonyms: “Doctor Rachel Elkins,” “Rachel Elkins foot doctor,” and so forth. Make a list of every website that pops up in your search results. Add to this list every website you know you’re listed on. This should include Facebook, LinkedIn, Google+, and any listings or social media sites that you’ve already claimed (Healthgrades, Avvo, etc.). Another good idea is to use the free services at Yext. Yext will show you exactly where you’re listed, Internet-wide. Add any sites that Yext finds to your list. You should now have a very thorough list (we suggest using a spreadsheet to organize this list) of the places your name is listed online. With this list in hand, move on to step three. Pro tip: Make the most of your time by ensuring that your name, address and phone number are identical on each site. Even a “&” on one site an “and” on another, a listing of “Stephanie” on one website and “Steph” on another will wreak havoc on the success of your local listings. So scrutinize each of your listings, correcting these mistakes as you go. Has this answer helped you better understand how to change your name online? If so, please feel free to share this article using one of the buttons on this page. And for timely, expert information be sure to like us on Facebook and follow us on Twitter. Good luck out there, and if you have any further questions please do not hesitate to call us at 888-886-0939. Are You Making One of The Seven Most Common Local SEO Mistakes? Should I embed my YouTube videos onto my website or host them myself? In the majority of cases for our clients, I do not believe that it's a good idea to embed YouTube videos onto your website. While this topic is hotly debated in the video and SEO world, I would argue that more times than not, doing so will actually drive people away from your site. Talk about counterproductive! You will find that the majority of information out there says that it is a good idea to embed YouTube videos, but those people are referring to content management systems like WordPress and Joomla. DSS, our proprietary CMS and inbound marketing software, has a lot more going for it than these less sophisticated systems and actually makes hosting videos extremely easy. Advertising for the enemy. When you embed a YouTube video you can’t control what shows up after the video. Videos from other lawyers or competing businesses are likely to pop up as recommended videos after yours has stopped playing. Modern humans are more distractible than goldfish, so when they get to the end of your video and see other options you run the very real risk of having them go off-page and even find another attorney, doctor, or business. No bueno! Loss of control. The fact that you have full control over the video you host is very, very important. When you add your video to YouTube, you lose full control of your videos; it's the price you pay for their hosting services. However, when you load your own videos, you have total control of them, and don't have to play by any else's rules. The annoyance factor. As I said in number one, when you embed a YouTube video on your site that video is likely to begin and end with an advertisement. Ads annoy users, so when they pop up, you run the risk an ad sending people off your website. However, when you host your own videos, users will be able to watch your videos without having to worry about an ad popping up on their screens. Level of difficulty. You hear a lot of people recommending embedding YouTube videos on a website because it is hard to create a separate video section. And with systems like WordPress or any similar content management system, this is true! But our clients have access to DSS, our proprietary marketing software, which includes a video section and a crazy easy uploading system. People also say that load times are improved with videos embedded with YouTube, but for our clients, bandwidth isn't an issue for websites run through DSS. Though I've given you several reasons not to embed YouTube videos in your website, I am not totally against embedding a few of them on your site. A few embedded here and there can give the YouTube videos additional views, thereby boosting their search rankings on YouTube. And some people do like to see the YouTube logo on your site; it can make the videos seem more "legit." But I really wouldn’t recommend making this the main way you are posting videos on the site, so choose the videos you embed carefully and keep an eye on how they're converting. Want to know more about video and its role in your SEO plan? Then call 888-886-0939 to speak with myself or a member of our team. We would love to help you make the most out of every video you post.